Today we head up the road to Manzanar National Historic Landmark, a US government “relocation camp” on the eastern side of the Sierra Nevada, some six miles south of Independence. At first the sparse landscape says little about the devastation experienced by Japanese Americans held under armed guard here during World War II. But stay awhile. There are many, many stories. The longer you stay, the more this sad landscape speaks. Now as then, Manzanar is bleak and desolate, little more than dust and sagebrush surrounded by barbed wire and other fence remnants. Two pagoda-style stone guardhouses, minus doors and windows, stand at the internment camp’s entrance; remnants of building foundations stick up from sand and sediments like bleached bones. A few buildings, gnarled but reviving fruit trees, a cemetery, and a monument—the austere Soul Consoling Tower, or Buddhist “tower of memory”—honor the Americans forced to live here after the Japanese attack on Pearl Harbor, the event that shocked the United States to sign on for World War II. Executive Order 9066, signed in 1942 by President Franklin Roosevelt, created Manzanar and nine other isolated Pacific Coast internment camps. That decree meant that some 120,000 men, women, and children of Japanese descent were immediately removed from their communities—many lost their homes, businesses, and personal possessions as a direct result—and then imprisoned by the US Army. There were no charges, no crimes, no trials, and no convictions. Still, 10,000 people, most of them US citizens, many with sons serving in the military, were herded into tarpaper shacks at Manzanar (“apple orchard” in Spanish). To its new residents Manzanar’s name surely seemed incongruous, but there was a thriving small town here, famous for its apples, before Los Angeles took Owens Valley’s water. Allowed irrigation water and the chance to work the land, internees soon returned this dried-up farm land to lush, productive acreage. They also built a tight-knit community. 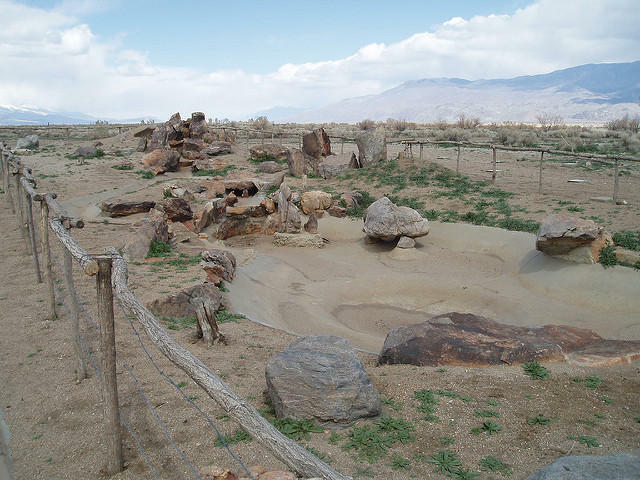 In addition to its orchards, gardens, and hog and chicken ranches, Manzanar once boasted its own Bank of America branch, an orphanage, a Boy Scout troop, baseball teams, pools, a nine-hole golf course (with oiled sand for greens), and a swing band called the Jive Bombers. The US Supreme Court struck down Roosevelt’s executive order in 1944, ruling it unconstitutional, and Manzanar was closed. Its legacy lived on, however. Upon returning to their hometowns, former internees often faced blatant racism and discrimination from former neighbors—and, this time, faced it largely alone. Explore the site. Take the three-mile self-guided auto tour—route description and map available at the entrance—or, with more time, bike it or take a walk. (Bring lots of water and serious sun protection, in summer.) Bikes and cars have to stick to roadways, but on foot you can go anywhere. 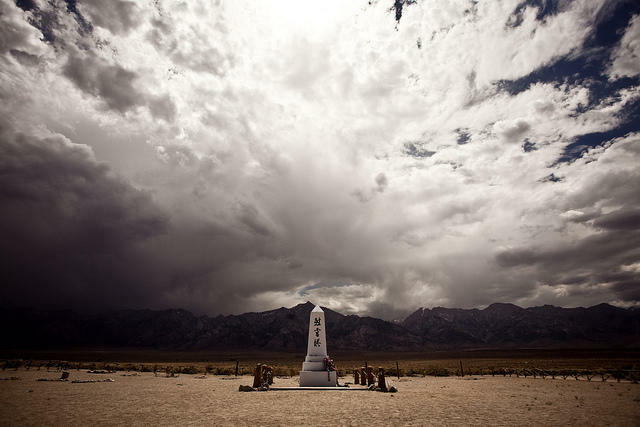 Every year, camp survivors and their families and friends make the pilgrimage to Manzanar, to remember. In late April 1992, the Owens Valley Manzanar Pilgrimage attracted some 1,500 people, to formally celebrate the establishment of the Manzanar National Historic Site by the US Congress. (In the hope that we’ll all remember.) And restoration has begun, albeit slowly, on this vast and empty monument to what should be our shared political shame. Various “lost” elements of Manzanar’s history are being found and returned, including the camp’s original mess hall. The old high school auditorium is now open as a visitor center. But the people who were old enough to remember Manzanar, other internment camps, and related events—they’re almost all gone. Which means the rest of us will have to do the remembering. The digital collection of Ansel Adams’ Manzanar photos—very controversial at the time—similar, more extensive documentary photography by Dorothea Lange, and books such as Farewell to Manzanar by Jeanne Wakatsuki Houston can help us remember. This week we continue exploring the Sierra Nevada’s dramatic east side, where the mountains drop sharply into the Great Basin. We head up the road from Big Pine to the White Mountains and the Ancient Bristlecone Pine Forest, home to the oldest known individual trees in the world—bristlecone pines, gnarled and gristly members of the species Pinus longaeva. Sometimes people skip the correct Latin–or attempt thereof—and just say “pine-us,” for the genus name, to avoid raised eyebrows in polite society. Today we head up the road to Mono Lake, an ecological marvel on the eastern side of the Sierra Nevada. We head up the road this week to visit Bodie, California’s official gold-mining ghost town and a very remote state historic park well worth the visit.